It is early morning and the room resounds with the bird songs. Automatically, and with great precision my hand reaches the bedside table and dismisses the alarm. Post alarm, the sleep is always the sweetest, sound, deep and very soothing. The alarm goes again. It is a Sunday, but it doesn’t irk. We have to get going early for a day outing that has been planned. In no time, the kids are busy packing food, water fruits and other paraphernalia for the trip. We are going to a nearby village and since the days are hot, we decided on early morning trip till the time the Sun is tolerable. Countryside is beautiful. 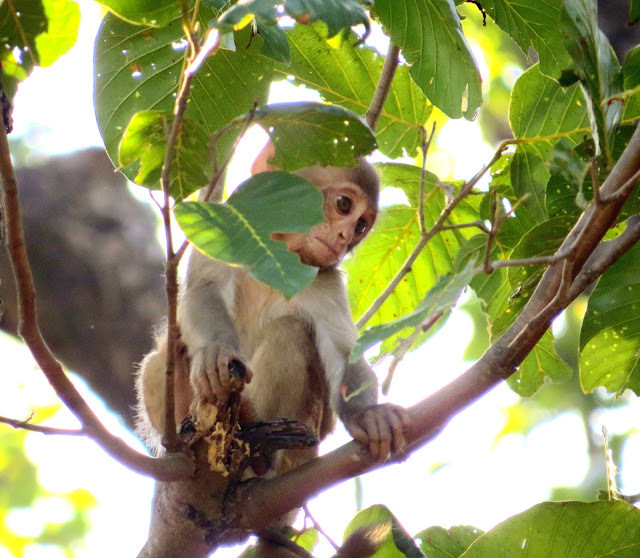 As we walk on a muddy track, a baby monkey looks at us curiously and hides in the branches. A group of buffaloes and some cows are chewing cud in unison and letting out “moos” every now and then. Kids click their tongue to get their attention but they pay no heed. Some chicks and hens are foraging in the fields. Our kids rush towards them and in no time, they are comfortable with each other. 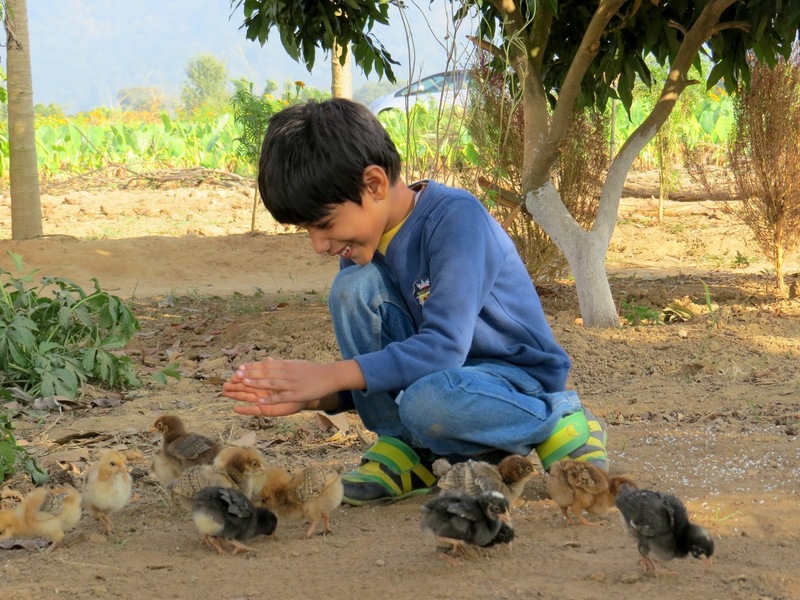 Kids should be made to interact with animals. 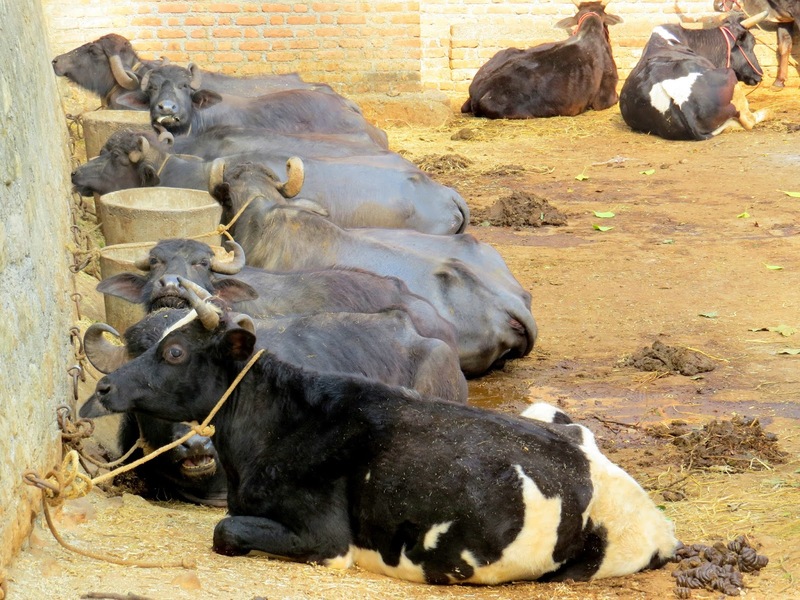 It makes them humane, loving and sensitive. Back home, we are expecting some guests for tea. A cake has been prepared and waits to be dressed. Marmalade and butter are whisked and warmed. Shiny glaze is poured over the cake. 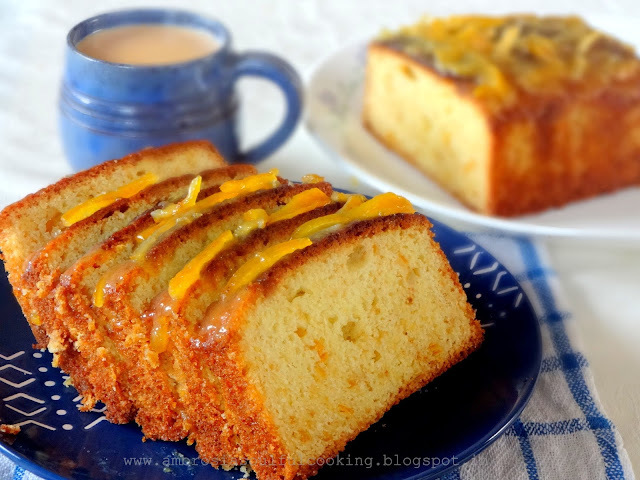 Soon, over tea and animated conversation, the cake is relished by all. 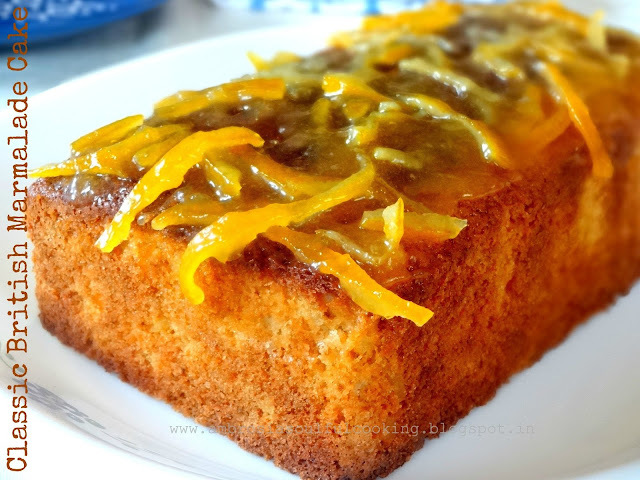 Misty winter evenings and a hot cuppa with a slice of very orangy and moist Marmalade cake makes the day! Preheat oven to 180 degrees C. Grease and line one 9x5 inch loaf pan. In a large bowl, whisk together first three ingredients. In a deep bowl, beat butter and sugar till pale and fluffy. Add candied peels or zest. Beat. Add eggs, one at a time. Beat well till the mixture becomes uniform. Now add marmalade and orange juice. Fold dry ingredients into wet ingredients till well combined. Do not over mix. Pour batter into the prepared pan. Level the top. Bake for 50 to 55 minutes or till the cake shrinks from the sides and turns golden. A toothpick inserted in the center should come out clean. Remove from the oven and let it cool for 10 minutes. Remove from the pan and cool in the rack. For glaze, take marmalade in a thick bottom vessel and melt over low heat. Add butter and whisk until smooth. Pour warm glaze over the cake and spread evenly. Slice and serve when cold. 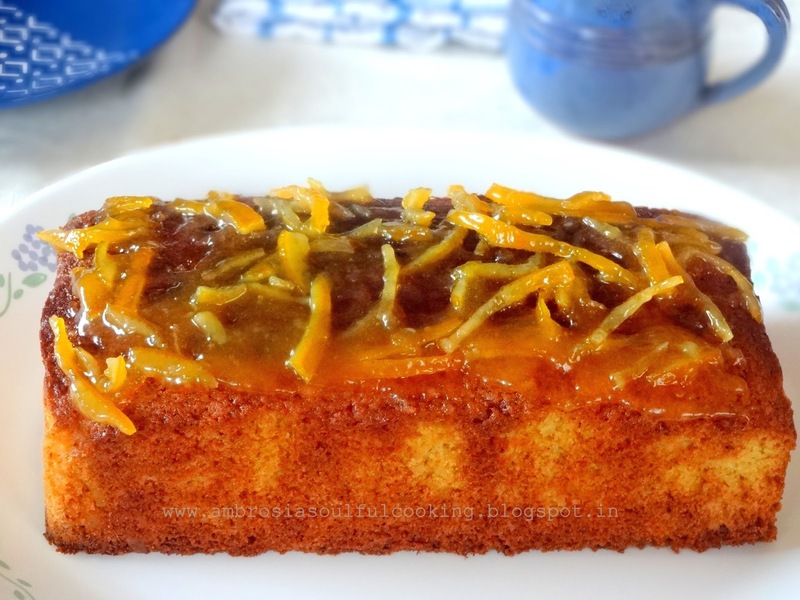 Namita i just love your write ups and recipes,can you come up with a eggless version of this classic cake? Hello Mamta, Thank you for visiting my blog and for liking my recipes. Yes, surely I will get back to you with an egg less version of this cake. Love and best wishes!